Arguably, archaeology is one of the youngest sciences, and one that has expanded enormously since the 1970s. It seems imperative to me that archaeologists document their profession, especially involving their own careers, and be aware of the important role of social media in doing so. As I reflect on articles I have posted, I realize that I have been doing this on occasion (typically when events suggest the topic). A death, an anniversary, the turn of the seasons can bring up memories and related stories. Three memoir-type blogs that immediately come to mind include one on an early 1980s meeting with Lewis R. Binford (written to commemorate his passing), a note on several months’ apprenticeship under the great Robert E. Funk, and my somewhat late realization that I had a forty year career in archaeology behind me. I would like to consider some general aspects of this kind of history-telling. These posts need to be truthful and should avoid subjects where good memory or documentation is lacking. Also, the point is not simply to write things that make us feel good about ourselves (for example, how we persevered to great success, or triumphed over adversity). And we should not write memoirs in order to structure the way we will be viewed in the future (such as with affection and appreciation!). Finally, when shared on social media these writings should be short. I think that the goal in this kind of communication is to capture senses of time and place within our professional lives while relating these to matters of greater archaeological importance in some meaningful way. For example, these memoir-blogs may provide historic context for important ideas or discoveries, or describe a relationship between things that happened in the past and some aspect of the state of archaeology today. I think that the three articles I just mentioned seek this goal and provide some examples of what I am talking about. The post on my conversation with Binford contains two points that transcend the events described. The first is that archaeologists and other scientists (even if they become the most influential speakers in their professions) most often study very mundane subjects of empirical research. At a certain time, Binford’s empirical research involved studying the formal variation of Lamoka and Dustin type projectile points. He described this in An Archaeological Perspective (1972:329), and it seems to me that he constructed his general program for projectile point analysis (Binford 1963), from this Lamoka-Dustin point research. This likely informed his perspective on artifact classification more broadly as well. It is perhaps the case that the failure to discover sub-types among these projectile point samples took Binford in other significant directions with respect to the meaning of material culture. Attention to the small or mundane aspects of material variation is important. These kinds of studies inform archaeologists fundamentally, and thought flows significantly thereafter from small to large subjects and back again. It is interesting to note with regard to systematics in biology and paleontology that Stephen Jay Gould’s frequent subject of empirical research did not involve dinosaurs, horses or hominids, but land snails from Bermuda and the Caribbean (for example, Gould 1977:253-282). The other point that arose in remembering a discussion about Lamoka points with Lew Binford is related to the fact that that we had just listened to several papers on the important subjects of mobility and lithic technology in hunter-gatherer adaptations. Numerous archaeologists in the session had built their research around Binford’s concepts and findings (indeed, you could call this area his teachings). It seems to me that Binford’s comment (and here I paraphrase) that “none of them got it right” reflects something that John Nemaric mentioned in his comment on that post. According to John, Binford believed that “understanding was a long and difficult process.” I think that a lesson here is that the method of understanding many of us look for evolves. It is a moving target. We actually don’t “get it right” the first time; sometimes not even in the early iterations (although we may get it right enough to earn Ph. D.s). We should eschew a turn-key mentality that would provide a way to operate that is not critically examined and redone as an essential dimension of its existence. Without putting words in their mouths (except for John’s quote), I thank John Nemaric and Rosalind Hunter-Anderson for comments that significantly broadened the context of what I was talking about in that post. The article I wrote about studying the Archaic under Bob Funk’s direction does bring me warm feelings. First, like many people, I liked Bob. Moreover, at the time of this apprenticeship (walking to the museum on a frequent basis), I felt warmed by the magnificent quality of the sunlight in October, when it reaches us at low angles but is still present enough to move me to reverie. This is an essay about experiential learning and enjoying the kindness of a mentor and his colleagues. But it also relates to the present-day status of studies of the Archaic period. It asks questions of ongoing importance. For example, do we know enough about the Archaic to reject significant, alternative interpretations of data that arise from new analyses? Do we know enough to maintain the common, evolutionist perspective that the Archaic is the platform upon which the Woodland developed? I ask this as I accept that Bob’s unusual inference concerning a Late Archaic longhouse at the Mattice No. 2 site is a good one (even if subsequent research eventually shows that it is unlikely). I will not elaborate on these questions here. Remember, posts need to be short and mine tend to grow overly long. However, I can recommend reading The Eastern Archaic, Historicized by Ken Sassaman (2010) to explore these ideas broadly within the context of eastern woodlands archaeology. The thankfully short post on my early career at first glance appears to be pretty self-centered, and of the sort that earlier in this essay I suggested needs a connection specifically meaningful to other people. Here is the connection: The substance of this article is that it is extremely important to involve an academic approach in the conduct of CRM archaeology. What I did in those old days at SUNY Binghamton still strongly influences my perspective on doing archaeology in a CRM context. Academic training and academic forums are essential. We need more of both. Moreover, we CRMers need to work to keep the romance alive with academic archaeology. It is important to continually find the middle ground where significant, substantive research can be conducted while meeting the expedient requirements of CRM. The great challenge not addressed in that post is that we need to convey this more broadly to everyone involved in the CRM process. In this regard– and starting inside and working outward– it is important for those of us who wear executive, entrepreneur, or manager hats to be present to implement, evaluate, and process the academic side of the equation when the fieldwork is being conducted; and to bring the results to everyone’s attention. In bringing these results to everyone’s attention, there is an important role for social media, both in immediate statements from the field, and later through communicating information broadly in the short time-frames available through blogging, Facebook posts, and tweets. For some of these posts, the memoir form and first person narrative make our statements more real, more historical, and more interesting. 1963 A Proposed Attribute List for the Description and Classification of Projectile Points. In Miscellaneous Studies in Typology and Classification, edited by Anta M. White, Lewis R. Binford, and Mark L. Papworth, pp. 193-221. Anthropological Papers, Museum of Anthropology, The University of Michigan, No.19. Ann Arbor. 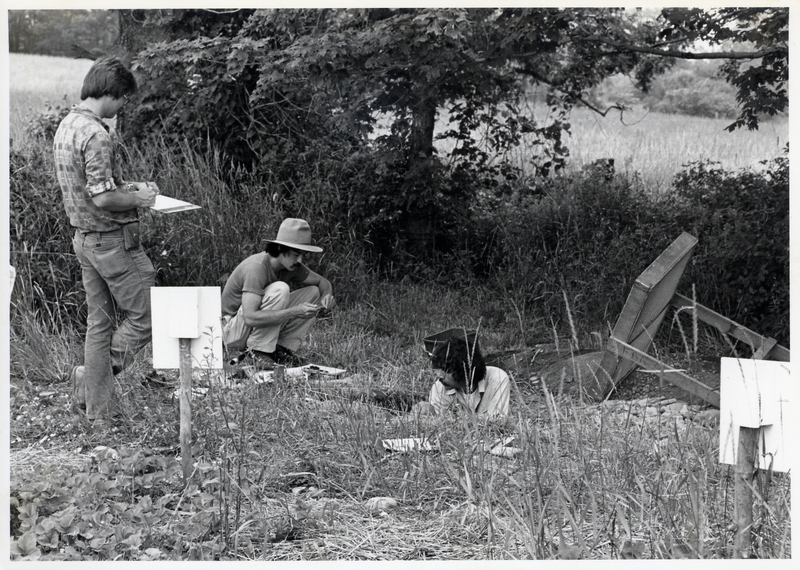 1972 An Archaeological Perspective. Seminar Press, New York. 1977 Ontogeny and Phylogeny. Belknap Press, Harvard University, Cambridge, Massachusetts.